Supply of the 2015 aluminum Ford F-150 should reach 40 percent of the F-150 mix on dealer lots by April, a Ford executive said Wednesday. In March, the 2015 model year was 29 percent of the new F-150s available on dealer lots, which Ford sales and marketing Vice President Mark LaNeve said was “right on plan.” He said in the Wednesday sales results webcast that it should be in the “low 40s” by April. A press release on March sales data is available here. The 2015 F-150 made up 21 percent of that model’s sales in February, up from 18 percent in January and 5 percent in December. “We’ve been signaling this for months,” LaNeve said of the slower increasing mix of F-150s this model year. He called it “uncanny” how close F-150 supply was to what the company had planned. The entire F-Series was at 56-58 days supply in March (Ford executives gave different answers) and was projected to be at 60 days in April. 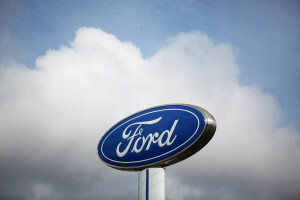 “We’re going to be working to build those stocks” during the following quarter, Ford U.S. sales analyst Erich Merkle said. F-150s in general lasted about 18 days on dealership lots in March, the same as February, according to Merkle. “It’s still turning very fast,” he said. The 2015 F-150 has been popular despite the potential for consumers to have been turned off by price (aluminum costs more than steel) or other complications of switching from steel to aluminum. For example, aluminum is more difficult to repair, and labor rates for the metal rightfully tend to be higher because of this and the need to recoup tens of thousands of dollars of preparation to work on the metal. The gains in dealership inventory — to say nothing of what will happen when fleets and other non-retail buyers start getting their hands on the aluminum truck — means it’s getting more important to figure out if you’re going to buy in or not. Granted, it’ll take about a year of crash and repair data before shops and insurers really know what this vehicle means for collision repair, but so far, Ford hasn’t had any major PR nightmares on the subject since the controversial Edmunds experiment. F-150 supply was initially limited — Ford has limited fleet sales in favor of dealerships to cope with it — as Ford converted its Dearborn, Mich., plant and then its Claycomo, Mo., plant over to produce the radical truck. The latter factory in the Kansas City area officially launched with three shifts in mid-March. Ford can now build more than 700,000 F-150s a year if it chooses. Last year, the Dearborn plant made 350,000 and the Kansas City, Mo.-area plant built 300,000. F-Series trucks sold for an average $2,100 higher than last March, though there’s no way to tease out model years, LaNeve said.